So I was inspired to make my first quilt after my best friend / partner in crime / sister / friendship soulmate and her husband told us they were pregnant. It was an absolutely amazing time, and I cried my eyes out with happiness as I knew as soon as they told us, that they were going to be amazing parents. With my my crafty, or so I think background, I decided I wanted to make a quilt for Baby Yards to have, hopefully forever. I had recently purchased my first sewing machine on sale at Spotlight. It’s a very basic Brother model, but it does what I need. I purchased it to make the decorations and what not for our wedding. So with a quilt in mind, I looked everywhere for an easy beginner pattern. 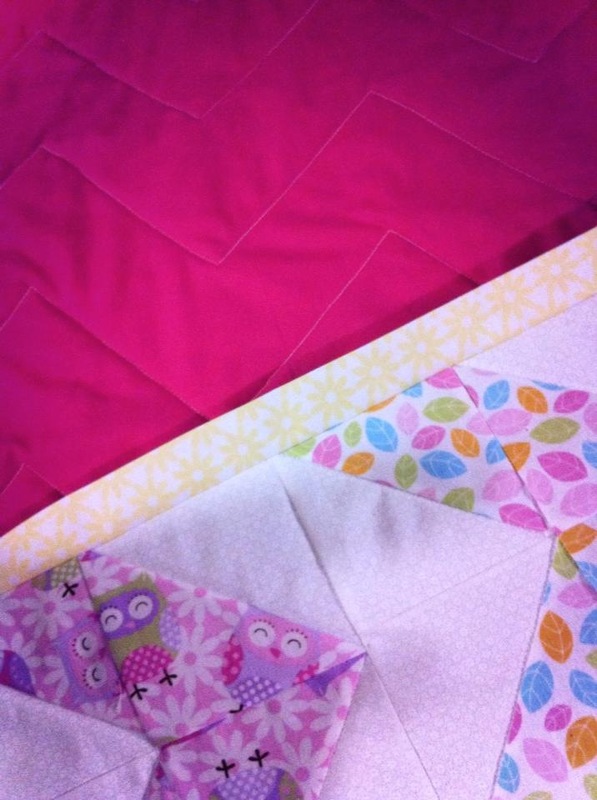 I liked the chevron designed quilt like this one & this one, so I decided to make one of these. I hopped off to Spotlight, and got some basics including a self healing mat, rotary cutter, fabric pen, and a plastic ruler. I knew nothing about types of fabrics, only that I wanted it to be pink and only have 2 colours. I learnt a lot on this quilt, including using enough seam allowance to ensure my quilt patches didn’t come apart, and what type of batting / wadding to use. I used solid pink fabric for the backing (partially because it was easy, considering it was a beginner’s quilt), and a white thread to contrast and so you could see the chevron pattern easier. 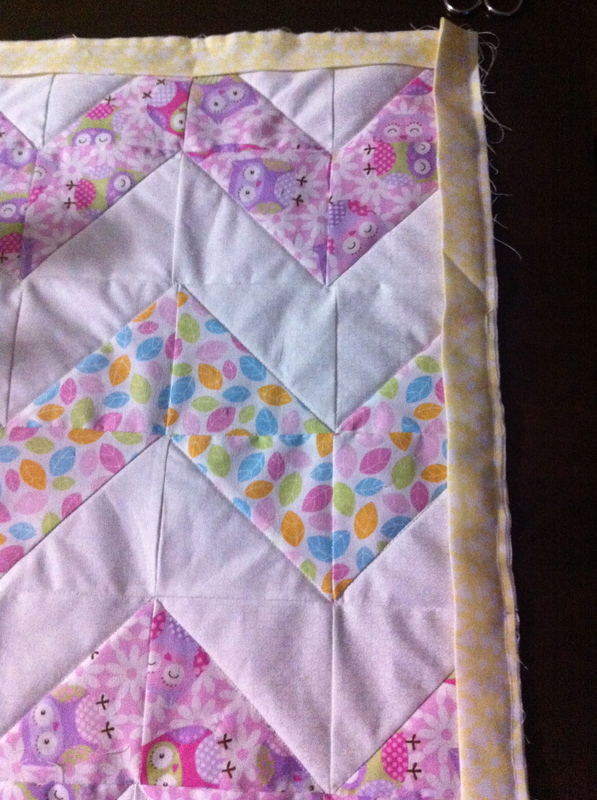 I used an awesome pink / purple / yellow based owl fabric, and alternated it with similar tones of a feature feather fabric. The white has small feathers embellished on it also. My binding was then a yellow flower pattern, which contrasted nicely against the pink, and tied in well with the front chevron patterns. Here’s some pictures of how it turned out. I am really happy with how it turned out for a beginner quilt, and little Myah loves it! In the process of binding my first quilt.